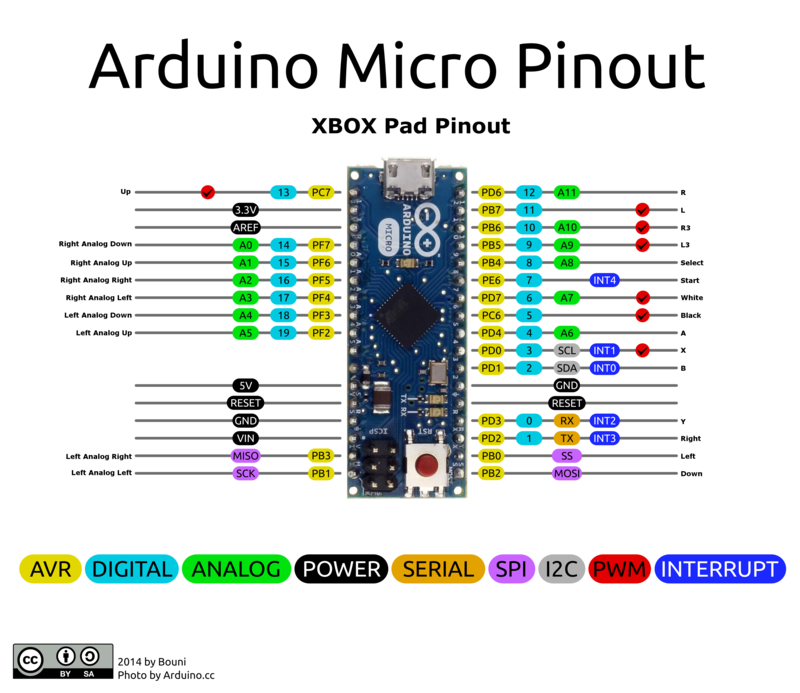 XBOXPadMicro - A firmware that turns Arduino Micro (Leonardo) into an XBOX pad! I was chatting with sharpfork about the lack of MinimusAVR cheap alternatives and he mentioned that people started to make pad-hacks again thanks to the AVR shortage. Re: XBOXPadMicro - A firmware that turns Arduino Micro (Leonardo) into an XBOX pad! Nice. I bought cheap S controller clones for rewiring. Does the library manage the rumble motors? So this is for use with the original xbox? I'm assuming it doesn't show up on a PC as an xinput controller? Yes, this is a Classic/Original XBOX encoder, so it shows up to the XBOX as a regular controller. It works with the Classic/Original XBOX only, not PCs or any other console. Thanks, man, this was starting to be a real problem for using original Xbox. I was looking at the pinout and I have one question? Where does the out to the xbox get wired in? The micro usb port? Yes, you connect it to the XBOX via the micro USB port. Forgive me and no offense but, why? Cheap and easy way to wire up arcade controls to an Xbox. So I flashed the board hooked up some buttons and it worked!!!!!!! Thank you! I have one request. Can you program on the unused pins to be a multiple button press. Like the 2 triggers, back, and black button, so that I can wire up one button to reset the system. So we have the first beta-tester! There are no unused pins. All pins are mapped to some functionality of an original XBOX controller. You could always wire up a single button to all desired functions to a single GND wire, that would achieve what you just mentioned. Did you have the chance to check if all pin functions in the diagram below are correct? You can use the Test Pad App in order to verify that! With this stick I was making for a friend and only needed it for arcade games so I gave him a simple Capcom style layout. With a few extra buttons for Coin, Start, L3 and System Reset. So I wired up the L, R, Back, and Black buttons together, and anytime i pressed any of the aforementioned buttons the system would reset lol So i thought if I could get one of the pins that wasnt being used to emulate the L,R,B,BL reset on one pin that would have been great! As I've mentioned. I still have a stash of minimus here. There doesn't seem to be much demand for them to continue pursuing a larger order of these. I have about 40 left. What were you selling them for again? initially i was just offering them at prices depending on who wanted them and how many they wanted. Sooooooooo..... bro price for one shipped? pm me a place where a postman can hand it to you. thank you for porting this over to 32u4! My super cheap Arduino Micro clone boards from eBay has just arrived. I've flash the firmware as per documentation and everything works as intended. Since the purpose of this firmware is solely to prevent people to padhack classic XBOX joysticks in order to get their arcade built in a simple and cheap way, I shall not add more features to this firmware, unless it's a critical bug. 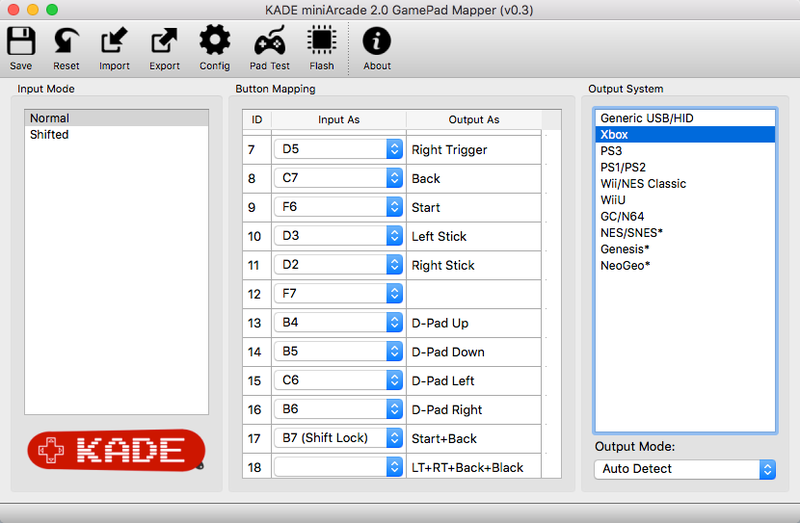 KADE miniArcade 2.0 < ?? there is going to be a kade 2.0 ? for the xbox ?? Output will be plug-and-play and automatic (no need to change firmware between output systems). It will be based on an Atmega32u4 (Arduino Micro is not an option because it lacks a couple of usable pins) and it will support several analog input ports, mappable to any button for output systems. No ETA. We still need to discuss how this is going to be released. Probably not via kickstarter. How about an unexpected XBOXPadMicro update? Since I know that you're looking for a no-soldering solution, here it is. The Arduino Micro knockoff board here sold by "gowoops" comes with header pins already soldered onto it. Connect dupont jumpers like the ones here to the desired header pins. Cut off the other end of the jumper, strip the wire, and feed it into one side of a euro-style terminal strip like this. I have a Arduino Micro clone (http://www.ebay.co.uk/itm/252639960296?_trksid=p2057872.m2749.l2649&ssPageName=STRK%3AMEBIDX%3AIT) that I'm trying to program with avrdude on widows 8. I can see them COM port ok in device manager. I have tried the drivers supplied with this XBOXPadMicro zip and also the latest. I have tried resetting the Arduino and running avrdude straight away (failing until the com port is re-established) but get the same error. I can download a sketch ok using Arduino IDE. After each try, if I rerun avrdude again, it will hang rather than giving the error message above. It will do this until I reset the Arduino. The verbose output from avrdude is attached. Programming the Micro can be a bit finnicky sometimes. You might want to use ArduinoBuilder to load the "XBOXPadMicro.hex" firmware file. There's a simple 3-step tutorial here. Thanks for that Scott. However, even with Arduino Builder I cannot load my hex. Searching for similar errors, some people found changing usb port helped - not for me. I'll maybe try another PC. Just to check....I should be able to program this directly using the USB port on the Arduino Micro? Or should I be using an FTDI adapter connected to the ICSP header on the Arduino? Ahh ok, the ICSP header isn't a serial port, so would need a separate programmer to use this port. Guess Im doing it right then by using the onboard usb on the Arduino. I tried another PC with the same result, even before loading the Arduino drivers it gave the same error so perhaps my issues lies in the drivers. Plug in your Micro then open Arduino Builder. Does it show "COM7" (or "COM8", etc.) to the right of the "Build Only" button? The "finnicky" part is that while "COM1" always shows up, sometimes the second port "COM7" doesn't. 2. Plug the Micro board into a USB connection. 3. 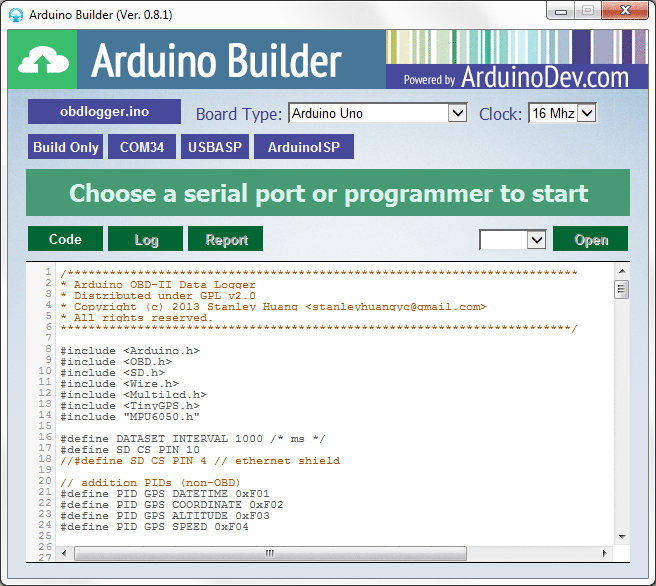 Open the Arduino 1.0.6 software. 5. Click on the right arrow (Upload) icon. 6. About 1-2 seconds later, press the reset button on the Micro to put it into bootloader mode. - Perfect timing on the press is just before the software finishes compiling and starts uploading. 7. If the upload fails, repeat steps 5 and 6. 8. Once the upload succeeds, go to menu "Tools-Serial Port" to verify that COM7 is visible. 9. Close the Aduno 1.0.6 software. 11. Set board type to "Arduino Micro". 12. Click on "Load Skech/HEX" and select the "XBOXPadMicro.hex" file. 13. Click on "COM7" to upload the hex to the board. Thanks Scott, what a polava! I didn't have any luck using the exact method you specified, but using ArduinoBuilder and resetting just as I pressed the "COMxx" button, it spotted the new com port and programmed my hex ok.